The first time I saw Bethany Yellowtail’s Sun Road Woman dress, the fabulous Jaclyn Roessel of Grownup Navajo was rocking it (while giving a presentation on Indigenous time travel that blew my mind). The next time I saw it was on a gorgeous stranger walking by at an art show during the Santa Fe Indian Market, right before I witnessed my first-ever B. Yellowtail runway show. I don’t own my own yet, but as Wayne Campbell says, “It will be mine. Oh yes. It will be mine.” Because now I’ve seen that dress enough to know that Yellowtail, who is Crow/Northern Cheyenne, has created the dress equivalent of the Traveling Pants: everyone who wears it looks incredible. 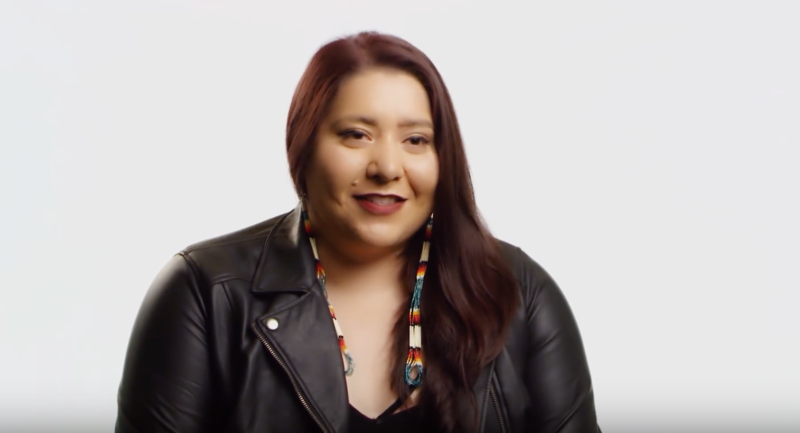 This week, PBS Indie Lens Storycast launched Alter-NATIVE, a six-part YouTube docuseries that follows a year in the life of Yellowtail. The first episode explains why that dress, as well as the designer behind it, is so powerful. The series itself begins in the time of the water protector camps at Standing Rock and ends with the Women’s March in January 2107. And it all starts with a situation familiar to most of us. "You know when you cut your hair really short, then it starts to grow and it's that in-between stage, and it's the ugly phase?" Yellowtail asks in the first episode. "I felt like 2016 was that for me." In her personal life, Yellowtail had gone through a bad breakup, and she wasn’t sure how she was going to recover. That same year, water protectors were gathering at Standing Rock to protest the pipeline, and activists continued to spread awareness of Missing and Murdered Indigenous Women (MMIW). The first episode of Alter-NATIVE tells how and why Yellowtail designed the Sun Road Woman dress, and how she melded her art and activism. We all hope we’ll rise up stronger from hard times, but in the middle of them, it’s hard to imagine. This docuseries is for anyone who needs to see the path of someone who made it through. Yellowtail’s clothing line, B. Yellowtail, is one of the most successful by a Native designer. But Yellowtail, who is based in Los Angeles, has shared her success with other Native artists since the beginning — especially through the B. Yellowtail Collective, which brings together designers from different tribes to produce clothing, accessories, and recently, home decoration. The collective recently partnered with Land of Nod by Crate & Barrel on a collection of decorative products for children. As for her clothing line, Yellowtail is always developing new designs that make me want to send her all my money. Alter–NATIVE promises to show how it all came about.